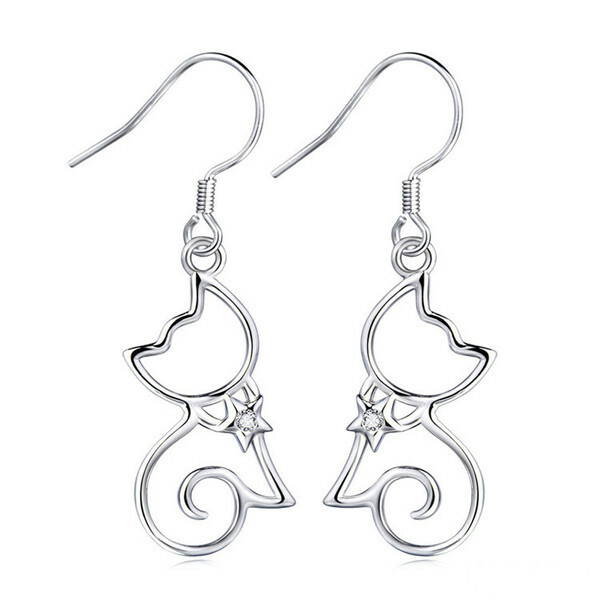 So when we saw these pretty Sterling Silver Cat Earrings with a Shining Star, we loved them instantly. 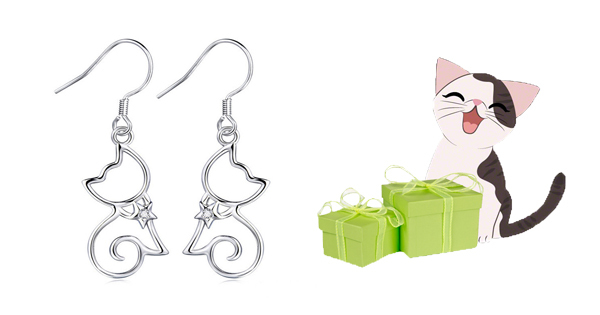 We have had inquiries about wire earrings too, so these seem like a purr-fect addition to our collection. There is just a bit of bling with the AAA cubic zirconia stones in the center of the star on the cat’s collar. These wire earrings are 925 sterling silver, lead and nickel free, measure 11.63 mm by 36.6 mm, so not too big and not too small. The earrings weigh in at 2.4g/pair. Your earrings will come boxed and ready to give as a gift but you might have a hard time giving these sweet earrings away. Leave a comment below this post telling us: Who would you sing “you are my shining star” to? I would sing this to my cat peaches. I would sing you sing You Are My Shining Star to my husband. I used to sing that song to my son Michael while I was pregnant with him. Unfortunately, he passed away so I haven’t sung it in awhile. I would sing it to my Granddaughter. I hope I win these for her, she would love them. These are great I would give them to my Daughter . My cats Samantha and Dylan, as well as the memories of Sassy, Annie and Big Guy. We’ve been so incredibly fortunate to have them in our lives. Love them all dearly!!! I would sing it to my boys Nikko and Mushu. Mushu literally wants to be the “star” of our Christmas tree this year. I would sing it to my kitties, Covu and Figgy! These are adorable! Thanks so much for the opportunity! To my two rescue kitties. I would sing it to my 3 pretty fur babies. I would sing it to my cats. They follow me everywhere! I always sing to my kitties!!! I would sing to my Grandkids. They’re probably the only ones who would tolerate my singing! I would sing to my cat, Neo. He has developed allergies as he has gotten older & now must endure taking a daily pill & some flare ups. I would sing it to my cat Lucy, because she is my shining star. I sing “You Are My Sunshine” to any of my fuzzybuttZ most of the time, but “Shining Star” is also on My Jukebox! I would sing it to my three wonderful daughters and my furbabies – four dogs and three cats. I would sing it to all of my kitties. They always make me smile! I would sing it to my grand daughters! They loves cats! I would sing it to my niece. To my bébé aka baby. She might drive me crazy but she sure makes my days brighter. William and Elizabeth – my brother/sister rescue kitties. I would sing to my wonderful snuggle bug Katie. My wife without a doubt. She is a wonderful, loving person. Congratulations Daniel! You are the winner of the Shining Star Earrings. You will receive an email notification when your package scans via USPS today. I cannot thank you enough. My wife’s birthday is Dec 16th. I would love for them to arrive in time for it. I know these earrings will make her day special. To my gorgeous house panther Oz! I have had a lot of shning stars in my life that I miss so much!. Right now I’m singing to my fur kitties Mushu and Sneaky Pie. I also have fur puppy Shunta. I like to sing to my tabby, Shamrock. My Siamese who passed 2 years ago loved for me to sing to her as well. I would sing to both of them and also in my head be singing to my nephews. I don’t think they’d let me sing to them in person! My dilute orange flame tip blue eyed boy who sits in my lap to help me watch tv. I would sing it to my cat Aio. She has health problems and is still a bright little spark. I’d sing with all my kitties, past and present, in my heart while looking in the eyes of the two purrballs who currently own me, Cam & Opal. I would sing it to my tripawed cat Trilly, who lost her foot as a newborn but has never let it slow her down! My sweet Tess <3 !!! I would sing it to my cat Oskar. I would and do, sing “You are MY shining star” to my beloved Oreo kitty who has very little time left with me; cancer is in too many internal places for surgery to even be an option. He is definitely my ‘shining star’ and I simply canNOT imagine my home, my heart, my lap without this sweet, playful and loving senior boy with me. to my cat Abby of course! !